Friends! I’m BACK! In the USA, that is. If you’ve been following along on my Instagram (@LonestarSouthern) you’ve seen that I’ve been on quite the adventure for these past two weeks. It has been indescribably amazing and too much fun (and I can’t wait to share all about it soon!) but as is to be expected at the end of a long trip, I’m exhausted! I’m currently writing this as I stand in the security line at the Boston airport to catch my connection back to Dallas… and the fact that a full-sized coffee awaits on the other side of the checkpoint (as opposed to a little espresso shot) brings me so much joy. I also am so excited to get back into a normal posting routine! Wifi issues kept me from posting 5 times a week like I normally do these past couple of weeks, so thank you for being understanding! Now on to today’s outfit… there is NOTHING like having the perfect, easy white top in your wardrobe. Style it with shorts and sandals, jeans and wedges, maxi skirts, denim skirts, and the list goes on! It’s the perfect solution to the “I have nothing to wear” problem, and always looks classic and effortless. 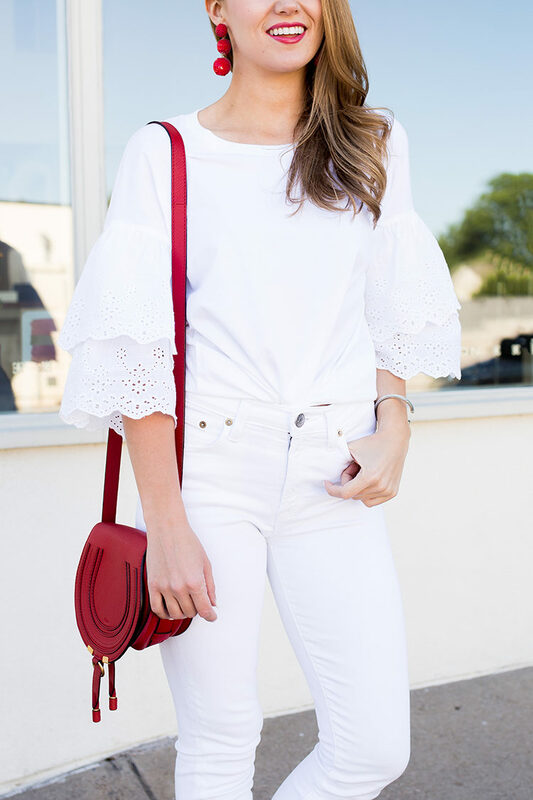 This eyelet ruffled sleeve piece may be my favorite this season! I love it paired with bold pops of red (how cute would this be for the 4th of July?!) and for all my Southern girls… it looks DARLING with cutoff jean shorts and cowboy boots. I love that this white tee in particular has the sweetest southern charm feel. I can’t stop wearing it! Don’t forget, if you missed yesterday’s post I put together a really fun “Which Lilly Pulitzer agenda are you?” quiz in honor of the 2017-2018 new releases! Check it out HERE! 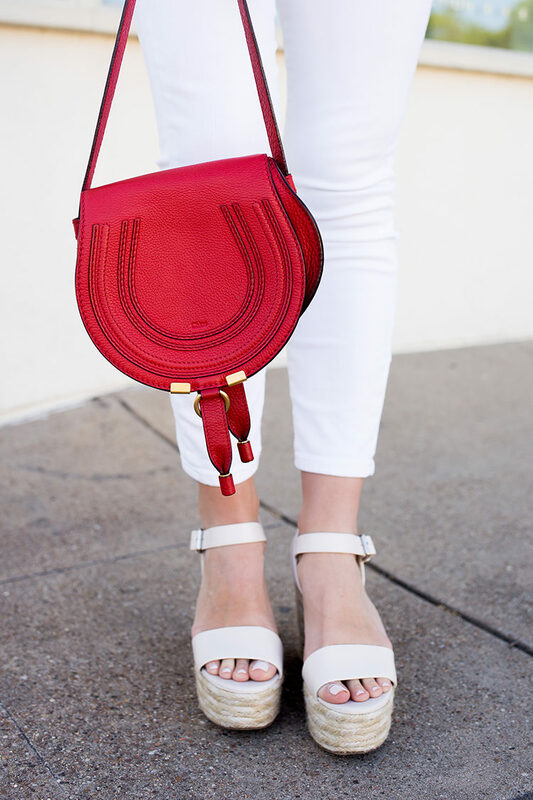 I love pops of color in an all white outfit! I am obsessed with the pops of color in this outfit that is so cute!! I love the simplicity of this outfit, and the pop of red in it! I’ve been in the market for whit jeans and those look darling on you. I’m definitely going to check them out. I can’t wait to here more about your trip! I love the white on white and that pop of red! So so cute for summer. I love this look, Kate! I would’ve never thought to pair red with an all white outfit, but you do it soo well!! This outfit is so cute on you, Kate! I love your top and your Chloe bag is so pretty! Conocerle fue suerte del destino;con solo mirarle la espera se hace pequeña y nuestras distancias se acortan.Su admirador. Yes!! You’re so right – this would darling with cut offs and cowgirl boots!